An intensely anti-bacterial and anti-inflammatory treatment utilising the benefits of the earth’s natural purifying materials – Kaolin and Bentonite clays as well as a fine ground bamboo scrub. This treatment is designed to normalise sebum secretion, alleviate inflammation and reduce irritations whilst improving the skin’s hydration, texture and tone. Recommended for oily, combination, congested and acneic skin types. A delicate facial treatment designed specifically for hypersensitive skin with visible thread veins or prone to redness and inflammation. This treatment will leave your skin moisturised, visibly firmer while also improving elasticity and soothing irritations and redness. The procedure uses preparations enriched with Vitamins C, Vitamin K and Algae to strengthen and seal broken capillaries, calm and soothe inflammation and reduce the risk of skin reactions. Suitable for all skin types, this treatment provides exceptional results for rectifying sun-damage, acne, scar tissue, pigmentation, enlarged pores and age spots. Improving texture and tone, this multi-tasking facial uses microdermabrasion crystals to polish away dead cells. The combination of lymphatic massage and exfoliation assists cell turnover and improves blood flow, while the Medik8 vitamin and antioxidant therapy significantly improves the appearance and condition of the skin following just one treatment. This luxe facial treatment is designed to give all skin types that special, pampered treatment they deserve. The Chase The Sun Lux Treatment is concluded with a luxurious paraffin wax treatment to reveal a glowing, healthier, hydrated, firmer appearance to the skin. A mild peel treatment to help blemish-prone skin and lightly wrinkled skin, the MediK8 light peel performs by effectively diminishing excess sebum, signs of aging and light scarring by unblocking pores and clearing away dead surface skin using gentle BHA and salicylic acid instantly giving you a renewed complexion. 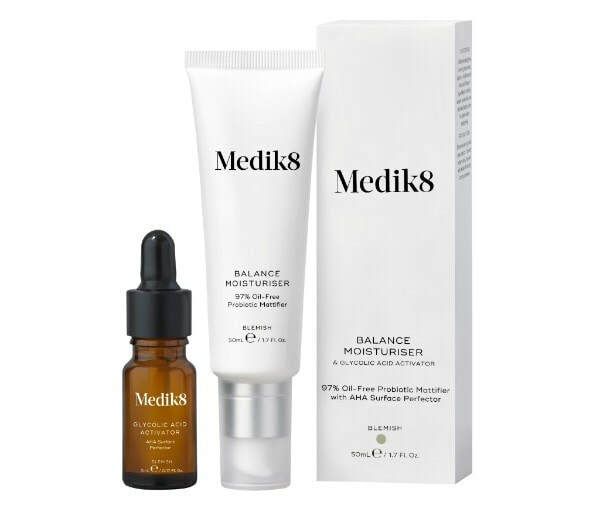 The Medik8 Eye Peel delivers the most effective solution to improve tone and plumpness under and around the eyes as well as fine lines, wrinkles and hyper-pigmentation. The eye area requires targeted attention as it is often the first places to show the initial signs of aging. Mandelic acid, a key ingredient is a potent exfoliant that, without causing unwanted irritation sloughs away dead skin to leave the complexion visibly smoother and rejuvenated. A pioneering skin research company working in the field of sensitive skin green cosmeceuticals. Medik8 also recognise that people with sensitive skin and redness can also have oily, dry or combinations skin which is why our range for sensitive skin encompasses all skin types rather than offering one sensitive option. The challenge for Medik8 is to make effective professional skincare formula less aggressive without reducing potency.